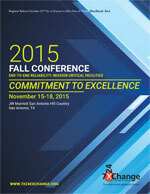 Online Registration is now closed for the 7x24 Exchange 2015 Fall Conference. We would be happy to assist you with your registration on site at the JW Marriott San Antonio Hill Country, San Antonio, TX. There is still space available. However, registrations can be emailed. If you wish to return your registration by email please complete “ONE COPY” of the Registration Form for each individual attendee and return it to accounting@7x24exchange.org … we look forward to greeting you in San Antonio.